Rolling Stone ran a story based on a supposed interview by the UK's Daily Mail in which Adam Lambert was quoted talking about touring with Queen as the new lead singer of the band. Sounds legit right? Actually no. Adam took to twitter and blasted the story saying the quote was taken out of context because he was talking about when he performed Queen songs at the EMA's. Well that fixes that disaster. 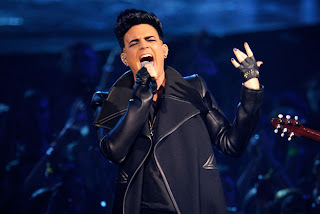 I know he seems like a good fit, but he is Adam Lambert. American Idol runner up. They need someone who is a little more solidified to take the place of Freddie. I actually don't think that person is ever going to come around, but I could be proven wrong. The most reliable thing about the Daily Mail is that you can't rely on it...it is always just so garbagy and skewed. I'm surprised that Rolling Stone wouldn't clue in to that. Everything that paper prints needs to be taken with a grain of salt, or 6.